Niamh first started playing football with Silvermines Ladies Football Club in 2015 and the next year won her first County Final medal in the U14 ‘D’ championship. In 2017 she was selected to represent her County with the u-14 age group. In 2018 she won both the u-17 ‘B’ and u-19 ‘D’ championship finals and was selected once again to represent her County at the u-16 age group. Ava started playing football in 2012 and in 2015 won her fist county final in the u-12 ‘B’ Championship . The following year representing her school she won the Cumann na mBunscoil County ‘D’ final. In 2016 as part of her Parish she won the Community games u-13 County final and in 2017 she was part of the Club Team winning the u-16 ‘C’ County final and also the u-17 Summer League. In 2018 she reached the u-16 ‘B’ and Junior semi-finals and also played with her Club Minor Team reaching the ‘A’ County semi-final. She enjoys participating in other sports, Camogie, Crossfit, Captained her school to their first ever girls Basketball team in winning the regional ‘D’ final in 2018. Swimming, Qualifying for National Divison finals yearly and representing her county on numerous occasions in the Community Games winning Bronze and Silver at the National Finals as part of her County Relay Team. Emma has played her football with Cappawhite since u-12's having previously played with the boys u-12 teams with Kickhams GAA club. She represented Tipperary in primary games, and played at half time in the 2016 Munster Final in Killarney. 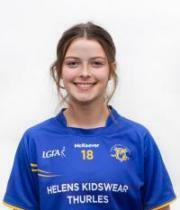 In 2018 Emma represented Tipperary in the Feile skills competition and was part of u-13 Tipperary Ladies football panel. She plays camogie for Kickhams, hockey for Tipperary town and plays football and hockey for her school. Sarah first began playing football for her club Ardfinnan in 2011 and in 2015 she represented her primary school winning u-11 and u-13 County 'A' titles. In 2016 and 2017 she reached the semi finals stages of the County Championships with her club Ardfinnan at u-14 and u-16 levels. In 2017 her team were runners up in the u-14 Divison 2 League Plate final. She started playing for Tipperary at u-13 level and on to u-14 and u-16. Sarah also enjoys irish dancing, competing in Scór and fleadh competitions. Clara first began playing football for her club Ardfinnan in 2011. In 2015 she represented her primary school winning County 'A' finals at u-11 and u-13 level. In 2016, her club team reached an u-12 'A' County final where they ended up runners up. In 2017, her team reached an u-12 'A' county semi-final where they were runners up. In 2018, her u-14 team were crowned League Division 1 Plate County Champions. Clara has represented Tipperary at u-13, u-14 and u-16 level and at u-14 level she reached the finals of All Ireland blitz in Portlaoise. In 2018 she won a Munster 'B' championship medal against Waterford, winning player of the match on that day and that team reached the All Ireland 'B' championship against Mayo. Clara also enjoys Irish dancing competing in Scór and fleadh competitions.